Why did Pitchfork 2011 book Odd Future? Worldwide icon-chevron-right North America icon-chevron-right United States icon-chevron-right Illinois icon-chevron-right Chicago icon-chevron-right Why did Pitchfork book Odd Future? The music festival’s founder Ryan Schreiber discusses the controversial hip-hop group. When did you decide to book Odd Future for the festival? We booked them for the festival over the winter. I’d seen their show at Webster Hall in New York [in November 2010], and the energy was just off the charts. Pitchfork has always been focused on emerging talent, especially artists who come at music from an interesting perspective and push boundaries, and they definitely fit the bill in that regard. Was there internal debate about Odd Future coverage on the site and the group’s inclusion in the festival? Yeah, there’s internal debate about pretty much every artist we cover. 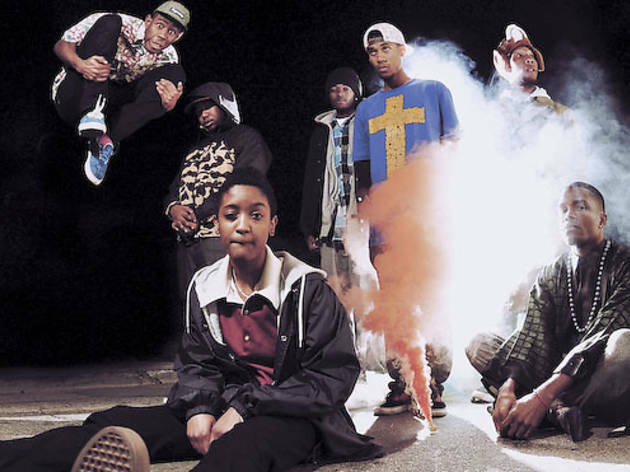 In the case of Odd Future, it wasn’t a question of whether to cover them so much as how to best address some of the stickier points surrounding them. Did you receive a lot of mail in response to rating Tyler’s Goblin an 8 out of 10? Not an unusual amount. Like any review we run, there were people who thought it was too negative, some who thought it was too positive, and others who felt it was pretty spot-on. Have you been contacted or pressured by any rights groups? Nah, I think the jury is still out for a lot of people, in terms of what their stage show is about. Are you worried at all about what will happen at the festival? I didn’t know what to expect from them in a festival setting at first, but I’ve seen them at two other big fests now, and it’s basically like a metal or punk concert. When Les Savy Fav or Mastodon or Boris have played in previous years, those who weren’t down with being in a mosh pit or getting stage-dived onto just hung back a bit. I’m sure lots of people will check out the other stage or hang out in the grass during their set, and those who’re excited for it will be front and center. I’m pretty curious myself.